WALK-IN X-RAYS ARE AVAILABLE AT BOTH OF OUR LOCATIONS. Columbus Diagnostic Center/CDC Northside both utilize the most up-to-date digital x-ray imaging available for faster, low-dose and clearer x-ray images. Digital x-ray imaging is one of the fastest and easiest ways for a physician to view the bone structures and internal organs of the body. 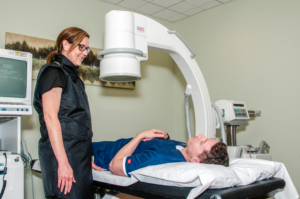 General x-rays are routinely done at our facility. X-ray imaging is an excellent tool for assessing skeletal trauma (i.e. broken bones), for diagnosing the gastro-intestinal system (digestive tract), and for comprehensive imaging of the thoracic cavity including the lungs and heart. A host of other applications for x-ray imaging are also available including imaging the kidneys, teeth and jaws, and the fine structures of the ear, nose and throat. X-rays are a type of electromagnetic radiation that are invisible and create no sensation when they pass through the body. Special care is taken by our technologists during x-ray exams to ensure maximum safety for the patient. Women should always inform their doctor or diagnostic imaging specialist if there is any possibility of being pregnant. During an x-ray study, patients will wear a lead apron in order to shield the other parts of their body (not being imaged) from radiation. Lead is a very dense material and can absorb 100% of the x-rays passing through it.